We can host from 30 to 500 guests offering a wide range of suites. Our new £2 million open lobby is fresh and stylish, incorporating vibrant colours, eclectic art, wooden accents and contemporary furnishings to create the ultimate chill out space. Introducing an all-day dining menu, a 24/7 coffee shop for travellers on the go, free WiFi and board games – it serves as the perfect hub for guests to meet, eat, work or relax. Enjoy the Wembley hotel’s night time buzz and meet up with colleagues or family to enjoy cocktails, coffees and a tempting range of snacks. Airport by car. The M1 is a 15-minute drive away and the hotel offers on-site parking for 250 cars and is outside the congestion zone. A wedding is one of life’s most important occasions and the memories created on that day will last a lifetime. We will do all we can to make your wedding day truly wonderful. Our Wembley hotel can host everything from small weddings of up to 30 guests to large lavish affairs with up to 500 people in the stunning Empire Suite. Our Wembley hotel has a wedding licence so you can host your full day with us. Asian Weddings are a speciality at our hotel in Wembley. We add grandeur and elegance to any Asian wedding celebrations; mehndi, sangeet night, walima, mandap ceremony, intimate reception or a black-tie event. Talk to our fantastic chefs who will prepare everything from exquisite canapes to a sumptuous Asian banquet. 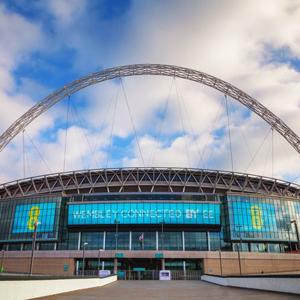 Our Wembley hotel is right on the doorstep of Wembley Stadium (our National Football Stadium), with its iconic arch that can be seen for miles around, beckoning you to the matches. The SSE Arena has a fantastic calendar of world class entertainment featuring all the big names in sport, music, comedy and family entertainment. If you are travelling for leisure, the Wembley Stadium hotel is very convenient for many top tourist destinations including Windsor Castle, The Royal Airforce Museum, Legoland, Thorpe Park, Syon Park, Kew Gardens, The London Transport Museum Depot. Our Wembley hotel is so close to excellent shopping it’s worth a special trip. Just two minutes from the hotel’s front door is the London Designer Outlet, a world class shopping, eating and leisure destination. You are sure to find some amazing discounts. On Sundays, you can visit Wembley Market, England’s largest Sunday Market. Brent Cross and Westfield shopping centres are very easy to visit and of course, the West End is just 20 minutes away by tube. The Wembley Arena hotel is also within easy reach of the North Circular, M1, M4, M40 and the M25. It has onsite parking for up to 250 cars and is outside the congestion zone. The Wembley hotel has quick access to London by public transport, less than 10 minutes to Baker Street/Marylebone from Wembley Park tube station or a direct Chiltern Railways train from Wembley Stadium Station to central London in 12 minutes. Our hotel in Wembley has thought of everything to make your meeting a success. We have seven fully refurbished meeting rooms all with natural daylight, air-conditioning and free Wi-Fi. They range from a small interview room to the fantastic Empire Suite - a large conference space for 500 delegates. Good food plays are an important part in creating a successful event. Our healthy and well balanced ‘Simply Uplifting’ menu offers a wide range to suit all tastes and special diets. Above all it is specially designed to help delegates maintain high energy and attention levels. Talk to our dedicated Conference Team at our Wembley hotel for room hire in Wembley. They love a challenge! They will discuss your needs with you and take care of all the planning and details leaving you to focus on your aims.